Balikbayan accuses NAIA personnel of 'planting' bullets in her luggage that forced her to pay money! Balikbayan accuses NAIA personnel of ‘planting’ bullets in her luggage that forced her to pay money! The Ninoy Aquino Internation Airport, the gateway of the Philippines to the world, has been voted several times as one of the worst airports in the world for several reasons such as poorly maintained facilities like stinky toilets, non-working air conditioned units, unusable escalators among others. But the worst thing that NAIA is known for is its reputation of being run by one of the most corrupt civil servants in the world. A case in point is the story of balikbayan based in the United States who recently posted on Facebook her own version of an extortion tale at the hands of the NAIA staffs when she traveled from Manila to Los Angeles on September 18, 2015. The Balikbayan narrated that she arrived at the NAIA Terminal 2 at around 6:30-6:45 PM on a wheelchair with 3 luggages in tow. She was assisted by airport porters. One porter was pushing her wheelchair while the other took care of her bags. As SOP, her luggages went through the motion at the airports’ X-ray machine. The X-ray machine like everyone understands it is a tool to identify contrabands, dangerous weapons and explosives so that the passengers using the airport terminal is safe from bad people. But what if the x-ray machine is used as a tool to terrorize the NAIA passengers? This is what happened ‘allegedly’ to the balikbayan. She thought it would be a smooth sailing at the X-ray machines like in her previous travels, but she was surprised when the NAIA staff called her attention. 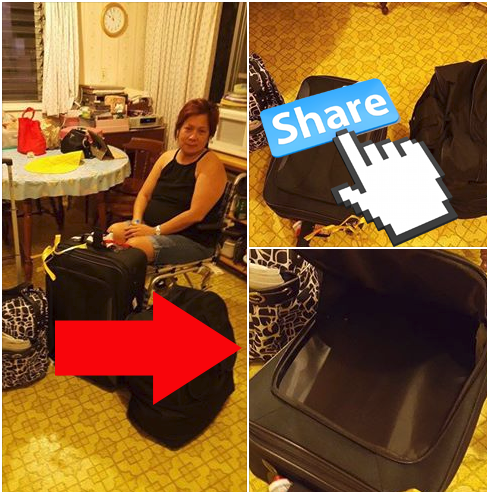 She never sensed trouble was coming since she was very sure that her luggages contained nothing but ‘Pinoy delicacies’ as usual ‘pasalubongs’ for her family and relatives waiting in Los Angeles. One NAIA staff approached her and whispered if she had any unusual stuffs in one of her luggages like an ‘anting-anting’ or amulet? Shocked by what she just heard, she said it might be a false alarm since there were other luggages that went through the X-ray machine. The NAIA staff manning the X-ray machine repeated the process. Then the lady staff called her attention again, telling her she had something strange inside one of her luggages. The balikbayan continued that she noticed a male NAIA staff ran his hand through the front pocket of his luggage while his back facing her. When he was done, he turned to face her with a closed fist and then when he opened his hands again, he was holding a bullet, one appeared to be ‘live’ bullet while the other is not. After this, her ordeal turned from bad to worse. The NAIA personnels quickly asked for her passport and green card and threatened her that they will put this on record and it will show up in her future travels. She tried to stay calm and reiterated that the bullets do not belong to her and that she had no idea where it came from. The balikbayan continued that why would a traveler like herself would do a stupid thing! “And where would I get those bullets?” she asked. After taking her passport and green card, the two NAIA personnel left and she said she did not know what to do at that moment. She remained steadfast that she had nothing to do with those bullets. She lamented she worked hard to get a green card and she is not stupid enough to do such things that could endanger her status in the US which is true. The female NAIA staff came back and the balikbayan said she requested for a re-check and insisted that the bullets is not hers. Then the balikbayan asked the female NAIA staff if there is a solution so that her record will not be tainted by any of these things. Out of the blue, the porter whispered to her that “she should take care of it and 500 pesos is enough to make her trouble go away!” The balikbayan then asked the help of the porter to carry out such transaction. Of course, the porter agreed to the proposition and told the Balikbayan to hand the money secretly because she did not want her supervisor to see her accepting money from airline passengers. The Balikbayan recalled she was so angry that for 500 pesos, there are people who would heartlessly destroy the reputation of hard working and honest citizen for that amount of money. So she told herself to give them 500 pesos for fear she might miss her flight back to Los Angeles with a tarnished record. She went through another body check and this time, she secretly handed the 500 peso bill to the NAIA personnel. And then she handed another 200 pesos to the porter as a way of thanking her for saving her neck. Lol! The question is, was the airport porter part of the grand scheme? The only loophole I notice in the story of the balikbayan is that she did not mention any names of the personalities involved. However, it does mean she is just making this up. The balikbayan was relieved that she arrived safely in Los Angeles and shared her NAIA horror story to warn other balikbayans. Let me direct your attention to the screen cap of the original post for your reading pleasure. Balikbayan allegedly extorted by NAIA personnel suing planted evidence. What is your opinion on this post? This is so much disappointing. share ko lang din karanasan ko nyan. August 15, 2015. pabalik ako noon papuntang KSA from an emergency leave. ilang araw pa lang pagkatapos ng libing ng tatay ko bumyahi na ako via Laguindingan Airport. may dala akong isang pack bag na ang laman ay puro damit. at isang parang clutch bag kung saan nandun yung pasaporte at ibang documento ko. sa Laguidingan pa lang, dalawang xray scanner na ang dinaanan ng bag ko.. at tuloy tuloy yung lakad ko as in walang sumita sa akin na may kakaibang bagay sa loob ng bag ko. pag dating ko sa manila terminal 2, sa entrance dumaan na naman ang bag ko sa xray scanner ganun din.. walang nakita hindi ako sinita.. nung ok na yung mga papeles ko, dumeretso na ako sa immigration at tuloy tuloy na yung hanggan sa pag pasok na sa pre departure area. dito na mag malaking question mark. nagulat na lang ako, pag daan ng bag ko sa pang apat na scanner, kinuha nung taga inspection, at sabi nung babae na nakabantay sa scanner na i check daw yung bag ko dahil mayron silang nakitang kakaiba raw.. sabi nung taga insoection sa na “check natin etong bag mo sir ha.. dyan ka lang .. tayo ka lang dyan”.. wala naman silang sinabi kung ano yung hinahanap. habang abala naman ako sa pag ayos ng sinturon ko at sapatos, tsaka yung mga malilit na bagay na tinanggal ko pag pasok ko, yun naman yung time na binuksan nila yung bag ko – hinayaan ko lang. hanggan sa pangalawang bese tinanong ko kung ano yung hinahanap.. sabi nung lalaki na may dalwang live bullets daw sa bag ko.. tapos pinakita nya sa akin.. dalawang bala nga ng .22.. laking gulat ko, kung papanu nagkaroon ng bala dun, sabi naman nung babae na tumawag na daw sila ng pulis. nung narinig ko yung, biglang na blanko ako kasi sabi idaan daw ako sa interrogation at possibleng makulong hanggang ma clear kung bakit daw ako may bala. kinuha yung passport ko at boarding pass.. that time talagang na blanko ako, hindi ako makapaniwala.. pero andyan eh sa harapan ko pinakita sa akin may dalawang bala. that time ang tanging lumabas sa bibig ko lang ay sinabi ko na ang pupuntahan ko ay Saudi Arabia.. walang ni sino mang mangahas magdala ng bala dun.. tanong pa sa akin kung first time ba raw babyahi patungong saudi.. sinagot ko nang maraming beses na akong pabalikbalik. habang nag aantay kami sa pulis sinabi ko na sir, kung ma hold ako wala akong pera pang bail o kahit man lang pamasahe pabalik kasi ubos na pera ko dahil nga sa gastos sa lamay hanggang sa pagpapalibing ng tatay ko.. at umupo na ko dun sa gilid nag aantay. ang nasa isip ko nun.. dahil desperado na sabi ko sa sarili ko what ever will be will be. hanggan sa pinatayo ako uli at may pinapirmahan na form parang report ata nila yun.. pinirmahan ko nakasulat sa pangalan ko na may bala akong dala. nung pinirmahan ko na, binalik sa akin yung passport ko at boarding pass sabay sabi na pwede na akong makaalis at huwag ko na raw ulitin. sa awa ng dyos nakaalis ako ng matiwasay, pero pasma ang inabot ko. madaling araw pa ako nagbyahi galing sa amin, walang almusal pag dating sa airport hindi na rin nakakain ng tanghalian.. kahit sino makaranas ng ganyan, tingnan ko lang kung gugutumin pa. nung nabasa ko yung trending sa fb parang nabunotan ako ng tinik, ngayon nasagot na ang katanungan ko noon kung bakit at kung papanu nagkaroon ng bala sa bag ko at ang nakakapagtataka hindi na detect sa naunang 3 scanner.